Company says software glitch may cause wheels to reverse, causing injuries to the rider. NEW YORK (CNNMoney.com) -- Segway Inc. is recalling about 23,500 of its electric scooters because the wheels can reverse direction and cause the rider to fall. Owners should stop using the devices immediately and contact Segway for a free software upgrade to fix the problem, the Consumer Product Safety Commission said Thursday. Segway is recalling about 23,500 scooters due to a software problem. 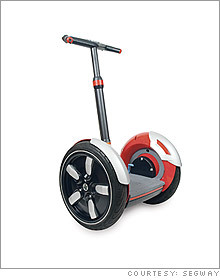 The recall affects Segways sold between March 2002 and mid-September of this year. There have been six reports where the scooter has not operated properly, resulting in head and wrist injuries for users, Segway said. Segway owners can reach the company at (800) 750-6557 or visit www.segway.com to register for the software upgrade. Among Segway's competitors in the electronic vehicle market are the Japanese company Sanyo (Charts) and U.S.-based Zap (Charts). Segway creator Dean Kamen drummed up much anticipation for the launch of his invention in December, 2001, saying it would transform the way people work and live.